Finishing facades and interiors with manufactured stone is a great solution if you have plans to renew, decorate and make your home more impressive! You can magically transform any facade or interior with the help of the facing stone from Art-Stone. The walls, columns, socles and niches acquire their stylish, inviting and cozy look. You get durability, a perfect interior accent and add bright colors into your life. Stone has its special energy: the energy of the earth, stability and protection. Stone trimming is often associated with castles, magnificent palaces, images depicting cozy small rural houses of Provence or Alpine villages. 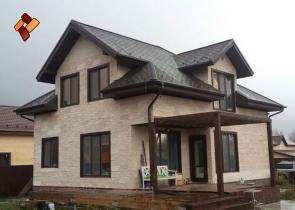 Harmony, balance, vitality and sustainability, this is what a person can acquire when finishing his or her home with manufactured stone from the Art-Stone company (city of Kazan). Have a look at the transformations of interior and exterior with the help of our stone. A beautiful house in the vicinity of Kazan acquired an elegant and noble look with manufactured stone finishing Feudal Estate Item Number 8. The property is faced with manufactured stone Weathered Canyon Item No. 06. Country house’s beauty is further accentuated by manufactured stone Rock Grotto Item No. 03. Manufactured stone Rock Grotto Item No. 03 is our top seller. A country house is transformed with finishing Medieval Castle Item No. 07. The interior of the apartment with finishing Wooden Brick Item No. 04. The magical transformation of a dismal house into a fabulous teremok* (facing with manufactured stone Northern Slope Item No. 01). *Teremok is a small wooden house, often used in Russian folklore. The country house changed its appearance by dint of cladding with Alpine Shale Item No. 04 and Feudal Estate Item No. 08. The porch is much more impressive now with the facing Stone Ridge Item No. 09. The country house is trimmed with our special stone English Fortress (Bewcastle). A new property is finished with English Fortress Item No. 010. A new property trimmed with Alpine Village Item No. 02. A wonderful house decorated with our exclusive stone Chalet Mirabelle. A gazebo finished with Medieval Castle and Rock Grotto. A country house finished with Prague Castle and Karelian Shale. The installation of our dry stack stone veneer panels can be made at any time of the year since it does not require the use of glue or other quick setting agents. The ability to use this facing material all year round makes it extremely convenient for those (both builders and homeowners) who plan to complete exterior finishing during the cold season, when it is impossible to apply adhesives. Here is an example of the revetment with dry stack stone veneer panels Florentine Shale.